Maximum rate of climb 2660 ft/min. 2145 ft/min. at full throttle height of 14,000 ft. 14,000 ft.
Service ceiling 36,300 34,500 ft.
Time to 20,000 feet 8.0 mins. 10.0 mins. Maximum speed 354 m.p.h. 337 1/2 m.p.h. at full throttle height of 17,400 ft. 17,400 ft. 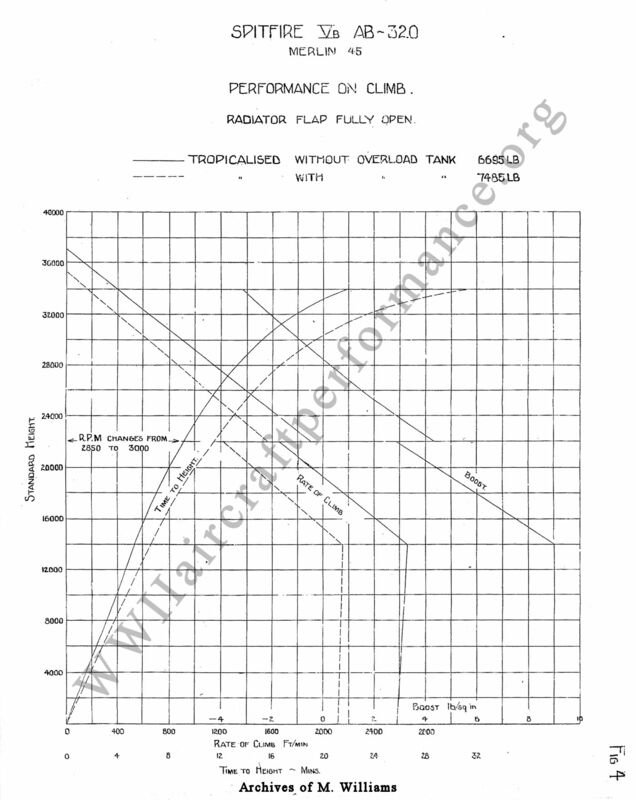 This report deals with climbing and level speed performance of a fully tropicalised Spitfire V.B. with a Merlin 45 engine, with and without a 90 gallon external overload fuel tank. In addition the position error correction curve was determined. 2. Condition of aeroplane relevant to tests. This aircraft was fully tropicalised; this included an air cleaner installation whose fairing produced an external bulge beneath the nose, and tropical radiator and oil cooler installations. In addition various items of desert equipment were carried. Details of this equipment and of the weights and loadings will be issued in a separate report. The 90 gallon jettisonable overload fuel tank was fitted beneath the fuselage of the aircraft. The aircraft was fitted with a Merlin 45 engine and a De Havilland constant speed 3-blade airscrew, and spinner. Triple ejector exhausts with fish tails were fitted. A standard Spitfire V.B. wing (not universal wing) was fitted and the two 20 mm guns and four 0.303" guns were in place. The leading edge ports for the 0.303" guns were sealed. An aerial mast was fitted in the usual position on top of the fuselage, and I.F.F. aerials were fitted between the tail plane tips and the fuselage. An external mirror was fitted above the front of the hood. The aircraft was finished in desert camouflage. Normal climbing and level speed trials were made with and without the overload tank, and the position error correction was determined by the "aneroid method". The position error correction was measured without the tank in place, at a weight of 6695 lb. The result is shown by the full curve in Fig.1. The effect of the increased weight when the tank is fitted was calculated, and is shown by the dotted curve in Fig.1. These curves were used in correcting all the speed figures quoted in this report. The position of the pressure head is given in Fig.2. and the correction to altimeter when connected to the staic of the airspeed system is given in Fig.3. The results of the climbing trials without and with the overload tank are given in Tables I and II and in Fig.4. The results of the level speed trials without and with the overload tank are given in Tables III and IV and in Fig.5. The position error curve obtained is in good agreement with the position error curves obtained on other Spitfires fitted with the Mark VIII head, when the differences in conditions are taken into account. 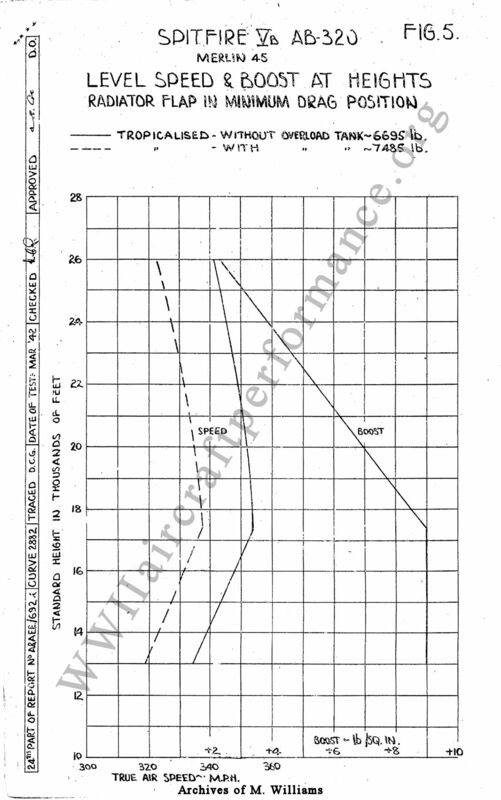 This indicates that the curve hitherto used for Spitfires, which was obtained with the Mark VII head, is not accurate over parts of the speed range when the Mark VIII head is fitted. A report will be issued shortly dealing more fully with this subject. Consumption tests are now being carried out on this aircraft with and without the tank fitted, and will be reported separately. R.P.M. changed from 2850 to 3000 at 22,000 ft. Estimated absolute ceiling 37,000 ft. Greatest height reached 35,000 ft. Estimated absolute ceiling 35,300 ft. Greatest height reached 33,500 ft.